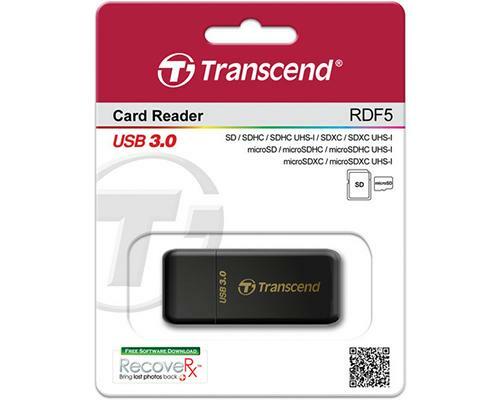 The RDF5 USB 3.0 SDHC / SDXC / microSDHC/SDXC Memory Card Reader from Transcend is equipped with a SuperSpeed USB 3.0 interface for fast data transfer. It is compatible with SDHC, SDXC, microSDHC, and microSDXC cards, including those carrying the Ultra High Speed Class 1 (UHS-I) designation. Insert your memory card into the reader and the plug the reader directly into an available USB port on your computer, in order to transfer images and video files from card to computer. A free download of RecoveRx data recovery software is also included with your purchase of this card reader.